Philippe Douste-Blazy, the newly appointed French Foreign Minister, is paying an official visit to Morocco on Tuesday. He said in an interview with the French daily Le Matin that the Moroccan Sovereign has set his country on the path of liberalization, modernization and dedicated social policy, and that France is determined to give him every support. “King Mohammed VI engaged Morocco on the path of liberalization, economic modernization, and a laudable social policy. The Human Development Initiative is clear proof of this strategy, and France is determined to back Morocco in this process,” said Philippe Douste-Blazy. The French Foreign Minister who is visiting Morocco on Tuesday in a first visit after he took over as head of his government in June 2005, said that “Morocco and France have a deep friendship and exemplary partnership, based on trustworthy and solid relationships.” The Foreign Minister wishes to continue the close and permanent dialogue which exists between the two countries on a number of questions of common interest. During his visit, Douste-Blazy will be discussing with King Mohammed VI the creation of a national research centre on infectious diseases and AIDS in Rabat, which was suggested by the King himself and the French President. High calibre teams from Morocco and France will be coordinating research activities. The French Foreign Minister praised Morocco's policy of decentralization. He noted that a delegation of many representatives of Moroccan municipalities paid a visit to France in April and met other delegates to discuss issues of relevant interests. “I am happy to see strong relationships established over the years between NGOs and municipalities of the two countries, because they help expand our partnership,” he said. As a mayor of Toulouse, Douste-Blazy expressed his will to develop a decentralized cooperation between Toulouse and a major Moroccan city, in which he would like to see members of civil society play a major role. Toulouse hosts many Moroccan expatriates who actively participate in the city's development. “I strongly encourage Moroccans who live in France to get involved in cooperation between the two countries because they represent a natural link between France and Morocco,” he emphasized. Concerning French aid to Morocco, the Foreign Minister said that the development agency fund, AFD is a major element of French cooperation, and that Morocco is the first beneficiary of AFD funding with 1,475 million euros. Concerning the Sahara issue, Douste-Blazy said that France's constant position is that it is favourable to a mutually acceptable political solution for both parties, within the framework of the United Nations. “We are convinced, like Spain and other partners, that a direct political dialogue between Rabat and Algiers would support the settlement of the conflict,” he emphasized. Commenting on the London blasts, the Foreign Minister told Le Matin that the only lesson to be learnt from these horrible attacks is the determination of all the democracies of the world not to yield before hatred and barbarism. 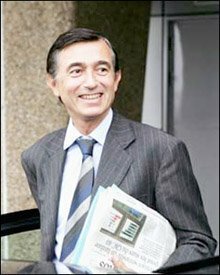 Former Minister of Health Philippe Douste-Blazy took over as Foreign Minister on June 2, 2005, when Dominique de Villepin succeeded Jean Pierre Raffarin as head of the French government. Born in 1953, this doctor's political career has been long and varied. Elected mayor of Lourdes and a European deputy in 1989, Douste-Blazy worked at the Health Ministry with Edouard Balladur administration between 1993 and 1995. He was also Minister of Culture in Alain Juppe cabinet from 1995 to 1997. He has also been a mayor of Toulouse since 2001.